Snoopreport.com Blog - Page 2 of 3 - Track your competitors on Instagram, research your audience and analyze influencers you want to deal with. As Internet takes an integral part of the modern life, it’s a great place for businesses to display their products and services. 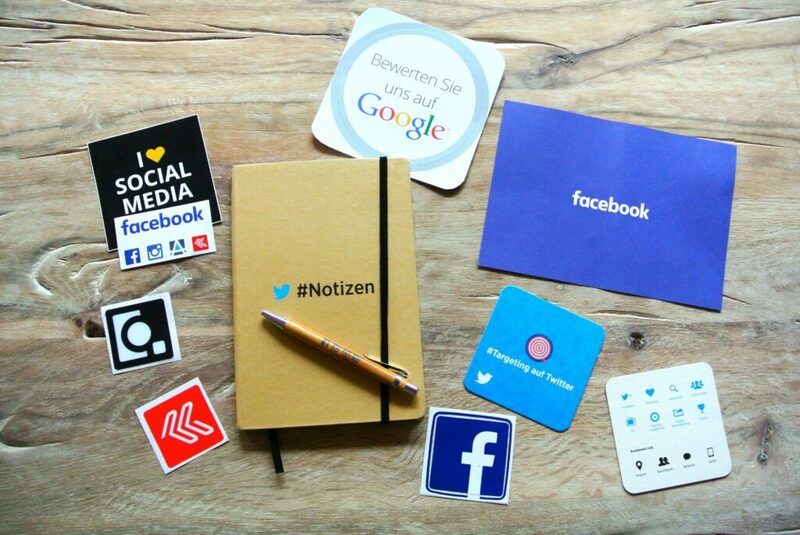 For more solid presence they tend to create accounts in social networks so to engage their customers and attract the potential ones. To be successful every brand needs a really effective marketing strategy of promotion. Of course, there is a simple way – just to pay for ads on all social media, buy services of the most expensive influencers, but it’s not 100% guaranteed that you will achieve your goals with such expenses. The most useful advice here is to prepare for setting up your marketing campaigns and not to jump in feet first. Of course you can analyze some common points on social media – celebrities and influencers posts, popular and niche hashtags, the competitors ways of promotion and so on. But why not to start with the monitoring of your customers preferences and behavior tendencies, your competitors growth strategies and raising new trends on Instagram? So then you can enrich your content and target the users you really need. Let’s see how it works on one of the most used social network – Instagram. 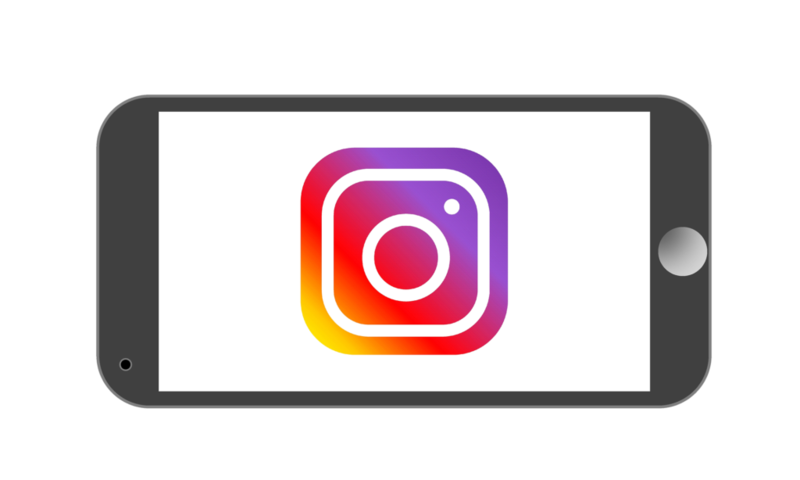 As Instagram is all about high quality images and stylish photos, the content related to fashion, car, travel industries is the most engaging. 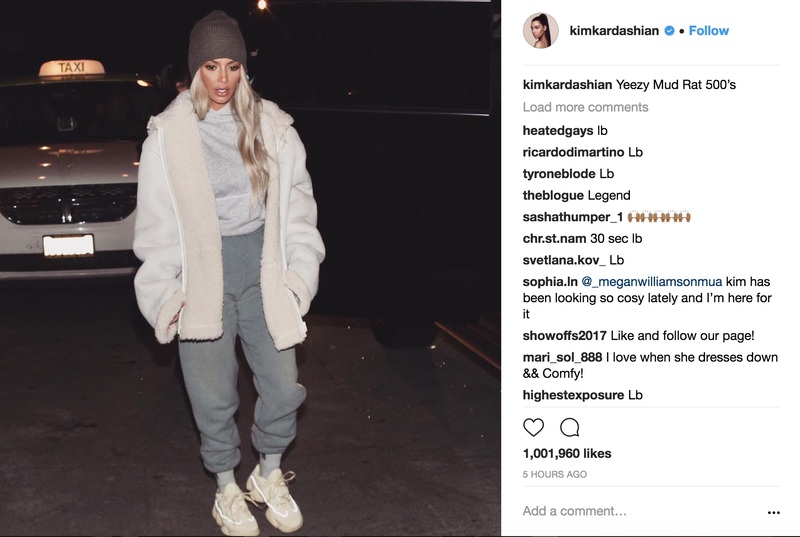 So to define the trends of gaining popularity content, the smartest way is to monitor users on Instagram: what photos they like, what posts they comment, what new users they follow. Influencer marketing is a type of marketing that uses social media celebrities and opinion leaders to broadcast your brand name, products or services to a large audience. The difference between influencer marketing and conventional marketing is you pay/ hire /inspire influencers (opinion leaders) to spread the message. Influencer marketing falls into two subcategories which are social media marketing and content marketing. In social media networks like Instagram influencers are expected to make a content go viral and spread the word via their personal Instagram accounts. Most social media influencer campaign carries a content element, so either you create the content for the influencers or they are tasked with both creating and promoting the content. There are some common methods for carrying out an influencer marketing strategy; depending on the scope of campaign and budget, brands and agencies make use of search engines like google or specialized services to find influencers to connect with, this method requires individual searches and using a spreadsheet to keep track of the information of all likely influencers. Snoopreport is the Instagram monitoring service that tracks user actions as likes, comments and follows. To start monitoring Instagram users you just need to add their usernames in your dashboard and buy a time package of 4, 26 or 52 weeks. Snoopreport will provide you the results in weekly and monthly reports in PDF format and all user actions in CSV report that contains the data about users, their posts, links and other metrics useful for in-depth analytics. In addition to the individual PDF and CSV reports Snoopreport also offers you group reports to apply for analysis of the user groups behavior. Snoopreport for marketers and analysts: we let you use it for free! Snoopreport keeps track of what users do on Instagram, what they like, comment and whom they follow. It’s the ultimate source of user insights. Now you can study users behaviour on Instagram, their preferences, habits, research influencers e.t.c. 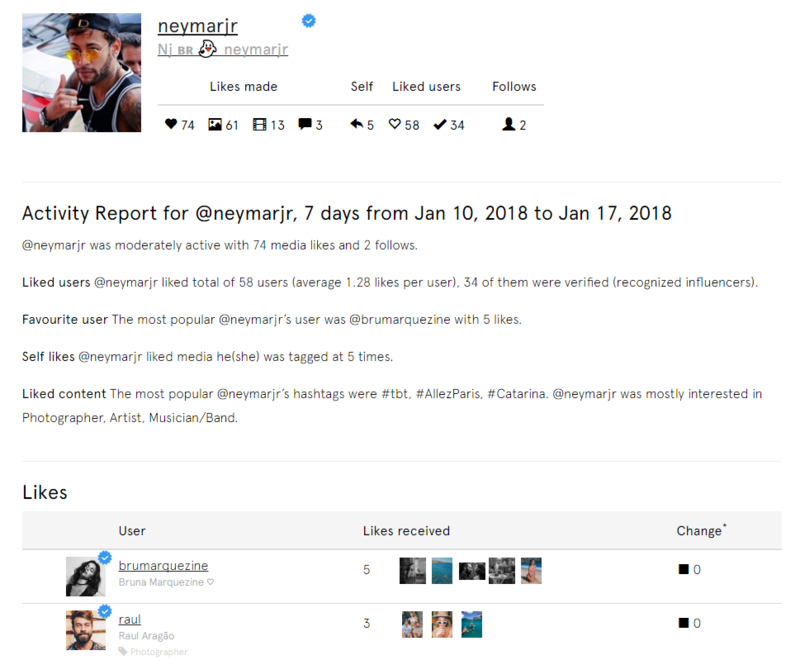 Snoopreport platform is the unique Instagram tool of it’s kind: Snoopreport monitors the user activity on Instagram as likes, comments and follows and provides it in handy weekly and monthly reports. You can sign up here: https://snoopreport.com/en/signup or check report examples here: https://snoopreport.com/en/instagram-tracking-example. We provide an easy-to-use simple PDF report as well as CSV report with all user actions and fields like posts captions, hashtags and geotags, direct media URLs for possible image recognition. See Snoopreport use cases for professional analytics here https://blog.snoopreport.com/2017/08/16/snoopreport-use-case-by-publicis-media-russian-office and here https://blog.snoopreport.com/2017/08/16/snoopreport-use-cases. Primarily Snoopreport will be helpful for brands and bloggers, marketers and analysts. That’s why we are ready to offer you to use Snoopreport for free! Nowadays you can find the presence of every company on social media. Facebook, Instagram, Twitter and others changed the way business build their marketing strategy. Brands create their image, online reputation on social media: they reach millions of their customers with their messages and have an outlet for discussion and evaluation of the brand’s products and services. Social media is the most successful element in digital marketing all over the world. Monitoring social media data gives you an opportunity to use the most of social media: track competitors strategy, listen to your customers, find influencers, and set your content marketing strategy. First, what is social media monitoring? Briefly, it’s the process of listening of what happens on social media. It includes all the user actions as likes, followings, discussions in comments about your company, your products, your competition – so anything. It’s a great opportunity to get what people think of your brand, what they like, what they think about your competition – what impact your marketing strategy has on social media. Let’s finally find out why you should monitor social media.